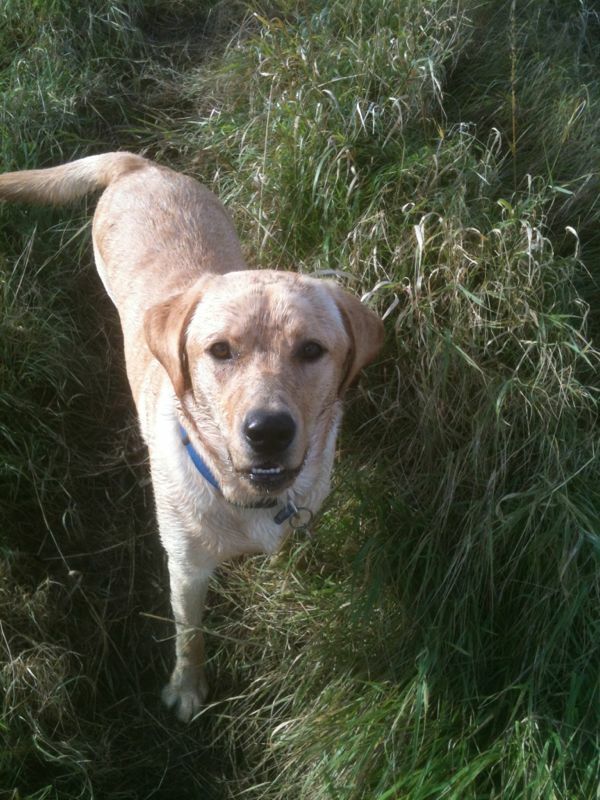 A daily chore task I carry out each morning is walking our beloved lunatic Labrador Chester. Post school run I gradually open the front door to see if he has destroyed anything in our hallway (his bedroom) while I have been out for the 30 minute round trip. I am eternally pleased that our Postman likes a lie in so that our post is not ripped to pieces before I return. We adopted Chester last summer from a rescue home. 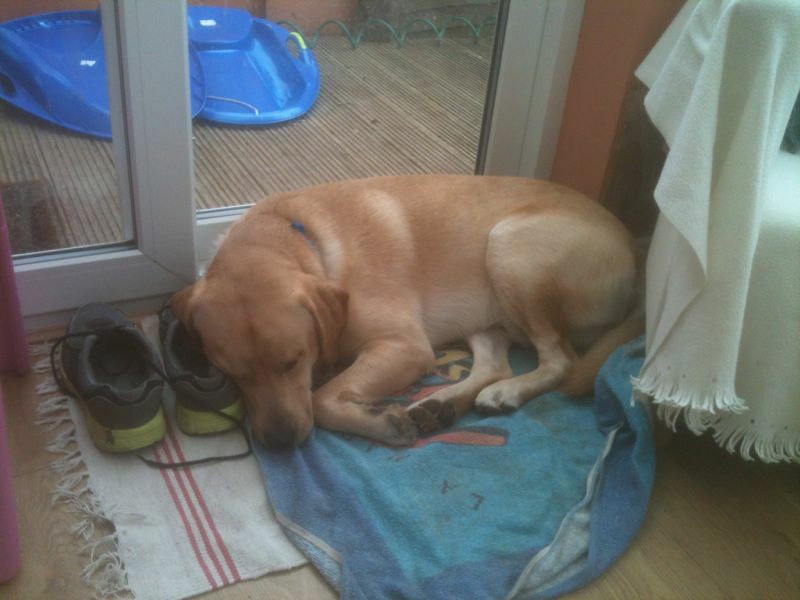 He is a Pedigree Labrador but as he was being rehomed due to his excitable nature (what do some dog owners expect?) 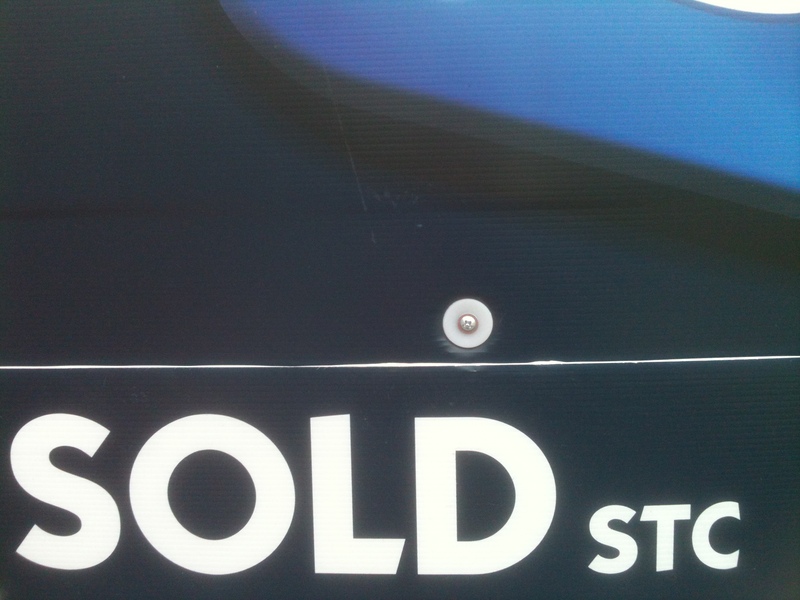 we got him at a reduced price, a sort of spoiled goods price. He was a gangly 6 month old pup who slotted into our lives perfectly. He turned 1 in November and is still as highly spirited (mental) as when he arrived but stupidly docile with the kids, with the added advantage of looking quite tough (though he really isn’t) so hopefully quite a good burglar deterrent. Despite the fact that I spend the majority of the day with him, feed him, walk him then shower the mud off him, clear up the chewed kids toys, re-wash the stolen socks and pointlessly hoover up the coarse golden dog hair, he is still very much a Daddy’s boy! Me and Chester hang out all day, the minute hubby puts the key in the lock I am literally pushed aside while Chester does a sort of dog samba dance in the hallway to greet his master. As an adolescent dog he needs a lot of exercise and as I spend a majority of my day working on the computer, the only way I can avoid trying to type without a huge dog lying across my lap, is to give him a long walk as my first job of the day. We are fortunate enough to live across the road to a series of farmers fields, they are privately owned for growing crops but have public walkways that we can use, which I bet the farmer just loves! On the edge of the first public walkway a local fellow has acquired a little paddock where he houses a rescue pony and two white goats. The kids love overfeeding his farm animals with carrots and apples and Chester has still not learnt to avoid a headbutt from the goats by sticking his head through the fence each time we visit them. The main downside of this mini farm is that the owner also has a big scary Mastiff effeminately named Lucky. The main reason for using the fields for Chester’s walks, apart from the convenient location of them, is that other than Lucky you really don’t see that many other dogs or people over there. My pleasure at walking without others doesn’t demonstrate that I am in any way a recluse, but anyone who knows my dog or has read my blog about my one stab at dog training (please scroll back to Just Call Me Barbara for a reminder) will know that Chester is sometimes a little hard to control. My fear isn’t that I think he may attack another dog or person but that he will most definitely jump up excitedly at the person thus ruining their clothes, whilst over-sniffing their dog’s bottom to the point of vulgar and we are talking dogs here remember! Chester is a very friendly dog, a very very friendly dog, he is also a big coward! If he begins to violate a dog in the cherished way he likes to do and that dog decides to bark/growl/make a sudden movement, then Chester yelps and runs with his tail between his legs to hide behind me. He actually had this reaction when a dog that looked like Toto from the Wizard of Oz growled at him, it’s embarrassing sometimes honestly. So my tactic is the (how Cesar would hate me for this) not to try to train him but to avoid dog/person contact at all times. 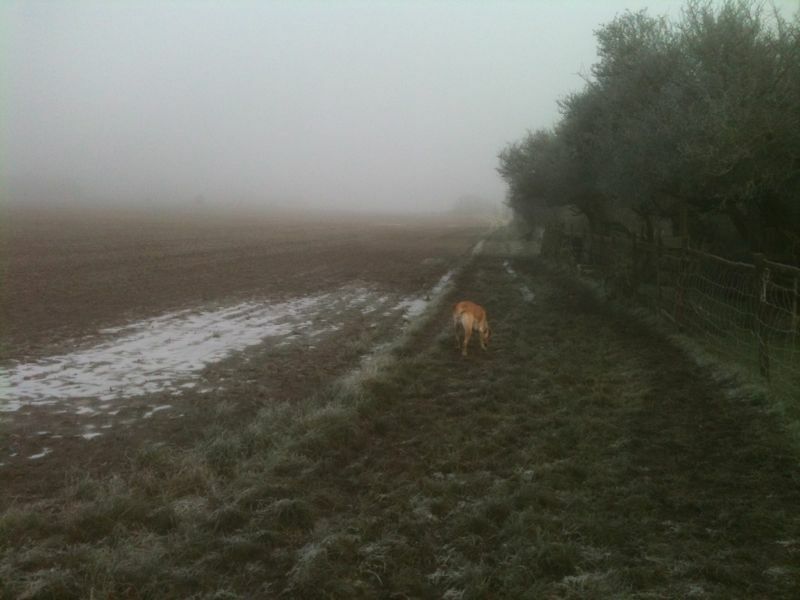 Yesterday morning Chester and I were on our usual dog avoidance walk over the very muddy fields (snow melts – mudbath begins) and found myself walking in the direction of Lucky and his owner. Thankfully, Lucky was on the lead but the way in which his owner was being dragged towards us and frantically pointing for me to go into the neighbouring field away from them, I gathered he didn’t have that much control. As I switched direction to avoid them, I saw a huge Alsatian in the field we had now entered. I have seen this Alsatian before, I always avoid him, he is in my eyes devil dog. I quickly retreated back to the previous field where Lucky and his owner were, then tried unsuccessfully to signal ‘Alsatian coming’ in a really bad mime. He thankfully slowed down to let me run (wade through mud) ahead of them. Next thing I know Chester has put himself in a crouched position on the floor with his head bowed down, then I hear the gentle padding of the Alsatian in stalking mode behind us. He steps up to Chester in stealth mode and sniffs him with a quiet growl, Chester is looking at me for help but to be honest the Alsatian is giving me the ‘I can take you both on’ look as he comes and sniffs my wellies. I pointlessly mouth ‘good boy’ to Chester who looks like he would cry if he were in human form. The owner, a very fragile looking woman is still making her way from the other field and my life is literally in her faraway hands as she neglects to catch up with her dog. And just as the Alsatian is menacingly circling Chester for the second time he suddenly stops then runs off with his tail between his legs. His owner finally catches up and explains, ‘he is scared of the Mastiff’ and then carries on after her devil dog. I then see that Lucky and his owner have caught up and scared him off, I have never been so pleased to see them. Stuck between two dangerous dogs, you have to pick a side I suppose. Lucky didn’t even bother to growl at Chester as he came closer to us as Chester was still in his crouched position, looking a bit pathetic now. Chester slept well that day which resulted in a very productive day for me. Not that I would want to repeat the experience again. This entry was posted in Uncategorized and tagged animals, dog, dog walking, farmer fields, nature on February 1, 2013 by madeinhornchurch.